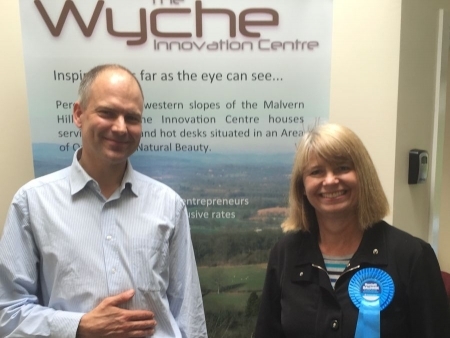 Harriett visited Malvern’s Wyche Innovation Centre - which is home to a handful of small businesses - as part of a national campaign organised by Karren Brady of The Apprentice. Small businesses across Worcestershire this week agreed to sign up to a letter supporting Conservative measures to lower taxes and reduce red tape, helping small and medium sized businesses to thrive and grow. Harriett commented: “Over the last five years I have championed initiatives like cyber valley where small start-up firms have set up base in West Worcestershire. “It is essential that we nurture these businesses and the Wyche Innovation Centre was created a couple of years ago to provide a home for small start-up firms. “It is now also a base for a number of impressive local businesses and offers a café for visitors to the Malvern Hills as well as a great space for businesses to meet.